These are the current major resources available for MND researchers in New Zealand to study MND, together with people living with MND and through their incredible donations of brain and other tissues after they die. The Neurological Foundation Douglas Human Brain Bank is a world-class scientific resource unique to the Centre for Brain Research. Brain and spinal tissue can provide vital clues about a variety of cell types in situ, including their neuropathology and the pathogenic mechanisms of MND. Please click here for more information about applying to study human MND brain or spinal tissue. Expanding on the internationally recognised Neurological Foundation Human Brain Bank, the multi-tissue Biobank provides human tissues and cells in conjunction with clinical, neurophysiological and brain imaging information, for expanded lab-based research on human brain disease. The Biobank secures and significantly expands the human brain tissue and cell bank resources, and encompasses other human tissues (e.g. blood, serum, blood cells, skin fibroblasts, muscle biopsies) for research and diagnostic purposes into human brain disorders. 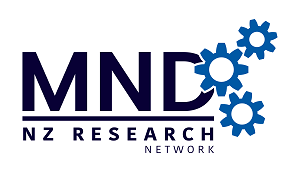 The NZ MND Patient Registry enrols people in New Zealand with MND, or with a genetic form of MND in their family, who are interested in participating in MND research. It aims to facilitate participation in research and to help researchers by assisting in the planning of studies and by helping to recruit participants. Please click here for more information about applying for the MND Patient Registry to communicate enrolment details for your study to people with MND. The University of Washington’s Institute for Health Metrics and Evaluation has created the world’s most comprehensive catalog of surveys, censuses, vital statistics, and other health-related data. It’s the place to start your health data search. They have a useful GBD comparison interactive tool available. Data made available for download by IHME can be used, shared, modified, or built upon via the Open Data Commons Attribution License. To find out more or to access this information click here. Project MinE promotes broad, transparent and responsible data sharing. If you have novel proposals with individual level array data please click here to be taken to the data sharing request page. Researchers can also access GWAS Summary Statistics that the group have gathered here. And there is a online Project MinE Variant Browser based on >6400 whole genomes from different European ancestry, and GWAS summary statistics as reported in Nature Genetics. Click here to access this. To find out more about how to access this information click here.